Our Winter concert took place Saturday 25 November 2017 in Malmesbury Abbey. It was a departure from our usual Christmas concert due to holding it earlier in our calendar year than usual. 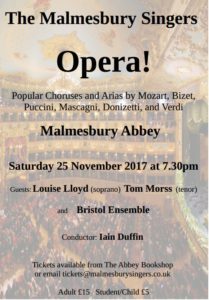 Malmesbury Singers and guest soloists soprano Louise Lloyd and tenor Tom Morss together with the Bristol Ensemble entertained the audience with a sparkling evening of operatic favourites on Saturday 25th November at 7.30pm in Malmesbury Abbey. 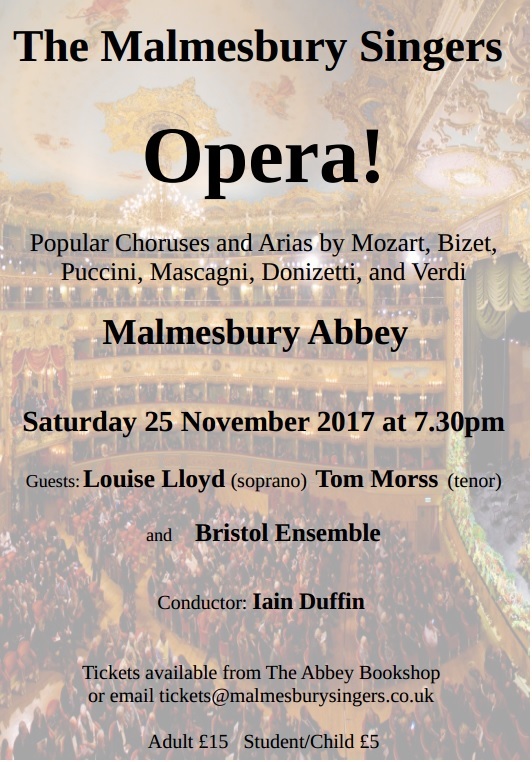 The programme, showcasing music by the operatic giants of the 18th and 19th centuries, feature overtures, choruses and arias from some of our best-loved operas, including Mozart’s ‘Marriage of Figaro’; ‘Madame Butterfly’ and ‘La Boheme’ by Puccini; ‘Carmen’ by Bizet; and Verdi’s ‘Aida’ and ‘La Traviata’. “We also welcome back the Bristol Ensemble, which has a growing reputation as a high quality and adventurous orchestra. The Ensemble appears regularly in Bristol and across the South West and appeared on BBC television in their performance of Handel’s ‘Water Music’ as part of the Bristol Harbour Festival in July,” said Iain Duffin. The curtain rises to the overture from Mozart’s ‘Marriage of Figaro’ and, after duets from this opera and ‘Don Giovanni’, the Mozart section ends with a wedding chorus from the ‘Marriage of Figaro’. We now turn to Italian opera, starting with a hauntingly tender aria from ‘L’Elisir d’Amore’ and ending with the spiritually uplifting Easter Hymn from Mascagni’s ‘Cavalleria Rusticana’. The next part of the programme is on that greatest of operatic themes, “love.” We hear from the gypsy heroine Carmen in the Habanera and finish this section with the highlight of Puccini’s ‘La Boheme’ performed by our two soloists, Rodolfo serenading his tragic Mimi in one of the most moving duets of all opera. The concert ends with a tribute to arguably the greatest composer of opera, Verdi, starting with one of the preludes from ‘La Traviata’, followed by the Anvil Chorus and the Chorus of the Hebrew Slaves , and culminating in the pomp and majesty of the Grand March from ’Aida’. It featured “a great line-up of performers and a fantastic variety of music”, said Iain Duffin. It was very well received by all who attended, with some very good reviews!